Nokia Lumia 525 and Asha 500 Spotted On Official Website: Coming Soon To Malaysia? Fresh from the recent launch of Nokia Lumia 1520, it looks like Nokia Malaysia is about to release yet another new Lumia Windows Phone 8 device into our market judging from a recent change to their official website. 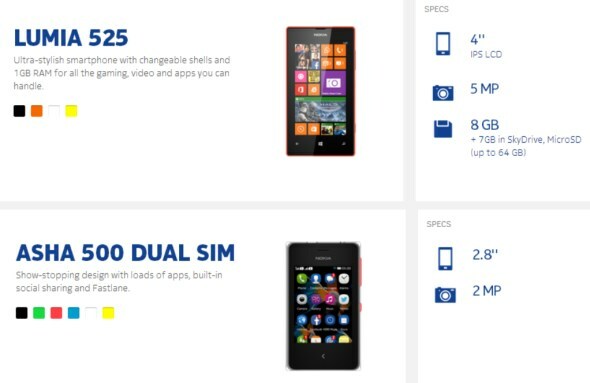 By change, we mean the addition of the brand new Lumia 525 into their catalogue. As far as we know, Nokia Malaysia don’t highlight devices that are not released in Malaysia on their website. Furthermore, they have also posted a teaser on their Facebook page last Friday that depicts the camera area of Lumia 525. At the same time, we have also spotted the new Asha 500 on Nokia Malaysia’s website. However, Nokia Malaysia have yet to reveal its actual release date and pricing at the time being. That being said, one can expect it to cost way under RM 319 which is the price tag for the slightly more advanced Asha 502 that was released in our market last month. If you a, do check back often for more information regarding both budget oriented Nokia devices once they are made available by Nokia Malaysia.